A day-long snowstorm had just passed when I flew Jean to Phoenix to see her mom. Lingering flurries receded to the east, while from the west approached the intense cobalt skies seen only after snow. By the time I dropped Jean and steered for my next appointment at Prescott, a few new snow showers sprinkled northern Arizona’s mountains. No worry–Flagstaff’s San Francisco Peaks beckoned clearly from between them for my subsequent flight home. Ninety minutes later, I preflighted for my final fifty-mile hop. Prescott’s Love Field Airport lies in an open valley, with Flagstaff 2,000 feet higher at the base of Arizona’s tallest mountains. Therefore you can usually see Flagstaff’s “Peaks” directly from Prescott’s airport tiedowns. Photo: “Seven Veils” (available as a Fine Art Metal Print): Red Rock Secret Mountain Wilderness from the GPS Runway 3 Instrument Approach into Flagstaff, Arizona. Recently I flew out-of-town visitors over the Grand Canyon. As always it was amazing, but I found myself dodging clouds so we returned early. Check out my other available Views from the Flying Carpet aerial photographs, and Down to Earth terrestrial photographs. Many thanks for the amazing response to this particular photo, and to all who have invested to date in my Fine Art Metal Prints, 2019 Photographic Wall Calendars, and Pilot Achievement Plaques. Announcing Greg’s 2019 “Down to Earth” Terrestrial Photo Wall Calendars! Nearly every day for years I’ve hiked or biked this beautiful wetlands near Flagstaff, photographing sunsets, weather phenomena, wildflowers, and birds. Finally this year I’ve collected some of my favorite and most unique Kachina Wetlands images into Standard and Premium-sized wall calendars, including many from my “Down to Earth” series of Fine Art Metal Prints. These calendars feature some of my favorite photographs shot in and around our beloved Flagstaff, Arizona, including several from my “Down to Earth” series of Fine Art Metal Prints. Once again, I’m also offering my terrestrial, “Views from Japan” photographic wall calendars. Check out my “Views from Korea” photographic wall calendars! Included are amazing photographs taken in the Republic of [South] Korea, little-known among Americans, with its fascinating blend of old and new. See Seoul’s renowned Gyeongbokgung Palace, Gunsan’s Barley Festival, traditional Korean horsemen in Jeonju, Gochang-eup Fortress, and more troubling, North Korea viewed from the Demilitarized Zone (DMZ) Joint Security Area. Check out my “Well, I’ll Be!” Photo Wall Calendar, featuring some of my wackier photographs. Click on each calendar image to preview and order, or visit my Calendar Store! Monthly photos for a given calendar are similar in both formats except for size. **CHECK CURRENT WALL CALENDAR DISCOUNTS HERE. All calendars can be shipped directly to you, or to others as gifts. Shipping and sales tax (if applicable) are additional. 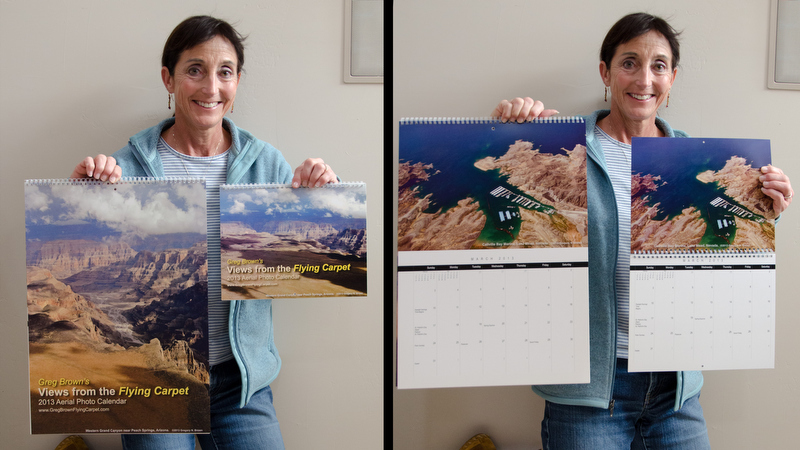 Announcing Greg’s 2019 “Views from the Flying Carpet” Aerial Photo Wall Calendars! Check out this year’s “Views from the Flying Carpet” aerial photo wall calendars, filled with recent aviator’s-eye views from around the country. This calendar comes in two sizes,* featuring some of my latest aerial photographs from my “Views from the Flying Carpet” series of Fine Art Metal Prints. Here are my “Views from the Flying Carpet Greatest Hits” aerial photo wall calendars, filled with my favorite aviator’s-eye views from around the country. This “Greatest Hits” version comes in two sizes, featuring some of my most popular aerial photographs from my “Views from the Flying Carpet” series of Fine Art Metal Prints. **CHECK CURRENT PUBLISHER DISCOUNTS ON MY WALL CALENDARS HERE. Here’s my latest Down to Earth terrestrial Fine Art Metal Print offering, “Sunflower Sunset,” photographed at Kachina Wetlands south of Flagstaff, Arizona. This summer has been one of the best in memory for wild sunflowers blooming in Northern Arizona’s meadows and mountains. Every time I go out, my camera insists on capturing more perspectives, and each time I post one I’m encouraged by audience response to take more. So thanks, everyone, for enabling my camera’s sunflower addiction! See all my latest “Down to Earth” terrestrial and “Views from the Flying Carpet” aerial photography Fine Art Metal Prints. As always, thanks to all who have invested in my photography to date, including Fine Art Metal Prints, Photographic Wall Calendars, and Pilot Achievement Plaques. Here’s my latest “Down to Earth” terrestrial Fine Art Metal Print, “Mountain Sunflowers,” photographed at Kachina Wetlands south of Flagstaff, Arizona. This summer has been one of the best in memory for wild sunflowers blooming in the meadows and mountains of Northern Arizona. Just the other day I captured this image of the San Francisco Peaks framed by sunflowers at Kachina Wetlands. “Sphinx Moth with Thistles,” (right) for their silent auction, and yes, more “Sunflowers!” (left) for their live auction. Coincidentally both of these were shot in previous years at Kachina Wetlands. Best of success to ANCA at their fundraiser! Many thanks to all who have invested in my photography to date, including Fine Art Metal Prints, Photographic Wall Calendars, and Pilot Achievement Plaques. Restricted airspace is something we pilots study and then studiously avoid. Fortunately, it’s limited enough in most places to easily bypass. But here in the Intermountain West, huge swaths of the stuff can dictate 100-mile detours. Jean and I regularly experience this flying from Flagstaff to Alamogordo, New Mexico to visit family. To bypass 135 miles of restricted airspace encompassing White Sands Missile Range, we must steer east past Socorro and then 90 miles south, or southeast to El Paso and turn north. Normally we take the shorter northern route. But when weather recently shrouded northern New Mexico, we launched via El Paso. Photo: Arizona Highway 85, viewed from 100 feet.